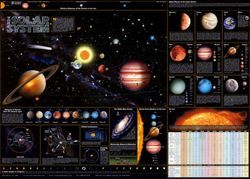 The very popular Solar System Chart offers a wealth of information. The main image shows a representation of each planet placed along a projected orbit line showing their proper arrangement. A graph along the top shows their relative distances from the sun. Other sections of the poster indicate relative orbits in relation to the asteroid belt, various comet paths and asteroids, and planet sizes. A chart provides comparative facts about each planet, such as length of year and day, mass, volume, surface gravity, temperature extremes, average orbital speed, and more! Includes new information about Pluto.